Amid The Horrors Of Wildfire, A Tale Of Survival And Singed Whiskers : The Two-Way As the toll from the Northern California fires continues to mount, with dozens of lives lost and hundreds of homes destroyed, small stories of hope continue to surface. Lucy and Ethel stand next to the charred ruins of Josh Weil and Claire Mollard's home in Santa Rosa, Calif. 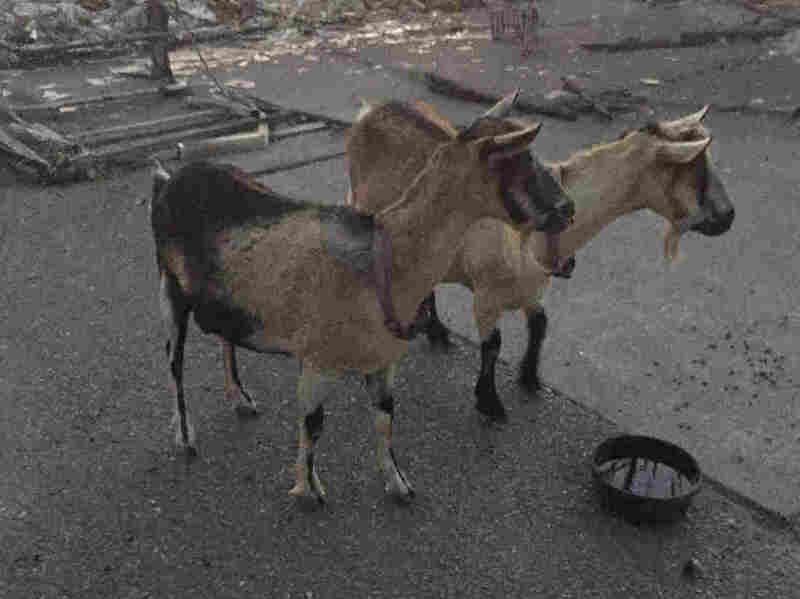 Someone, likely firefighters, gave the goats a bowl of water. The toll from the Northern California wildfires continues to mount. More than 40 people have perished. Hundreds of homes have been destroyed. Farms, cars, livelihoods, artifacts of lives lived. In times like these, sometimes the only thing people have to hold onto are the little stories of survival. This one is about goats and one very loyal dog. It was 1 o'clock in the morning on Oct. 9 when Claire Mollard's husband called and told her to pack up some valuables and think about evacuating their home in the Santa Rosa hills in Northern California. Her husband, Josh Weil, is an emergency room doctor and operations chief at a nearby hospital and was working the night shift. He'd heard chatter on the paramedics' radio that the massive Tubbs Fire was heading toward their home. Mollard woke her 15-year old daughter, Sophie, and told her to get dressed. Then she took some belongings out to the car and saw the glow in the sky — it was the color of merlot wine. A few minutes later, she knew they were in trouble. 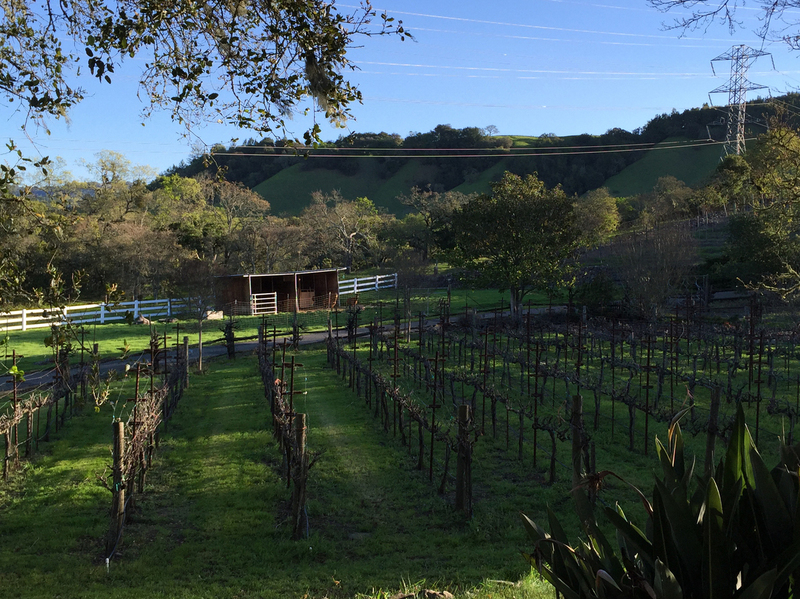 The green pastures where Lucy and Ethel grazed before the Tubbs Fire decimated parts of Northern California wine country. "The whole sky was red now and the wind was blowing like crazy," Mollard recalls. But it was the noise that struck her most. "It was so loud, just roaring, howling." She raced inside, yelled for Sophie and grabbed the family's two dogs. They could see the flames just a hundred yards away. Mollard made one last dash into the house to find their cat, but it was too dark and smoky. The power was out. She opened doors and windows, hoping he'd escape. By then, the fire was "raining down on us," Mollard says. As they sped away, she saw their goats, Lucy and Ethel. They were standing solemn in the pasture. A little farther north, in the mountains of Sonoma County near Calistoga, Roland Hendel and his 14-year old daughter, Ariel, were also in trouble. The smell of smoke had been thick in the air all evening. Around 11 o'clock, Hendel went to a small deck on the roof of his house. He watched the sky glow orange, and then he saw the flames. "I just stood there and watched as the flames got bigger and bigger." And then he ran. He and his daughter managed to get Tessa, one of their two Great Pyrenees herding dogs, into the car, but the other one, Odin, wouldn't leave the goats. The Hendels have eight pet goats that they rescued from slaughter as newborns. His daughter bottle-fed them all. They were part of the family, and it was Odin's job to watch over and protect them from predators. "Odin is sitting there and he's looking at me and he's not going anywhere," Hendel says. "So I said, 'OK, take care of them.' Then we got the hell out." 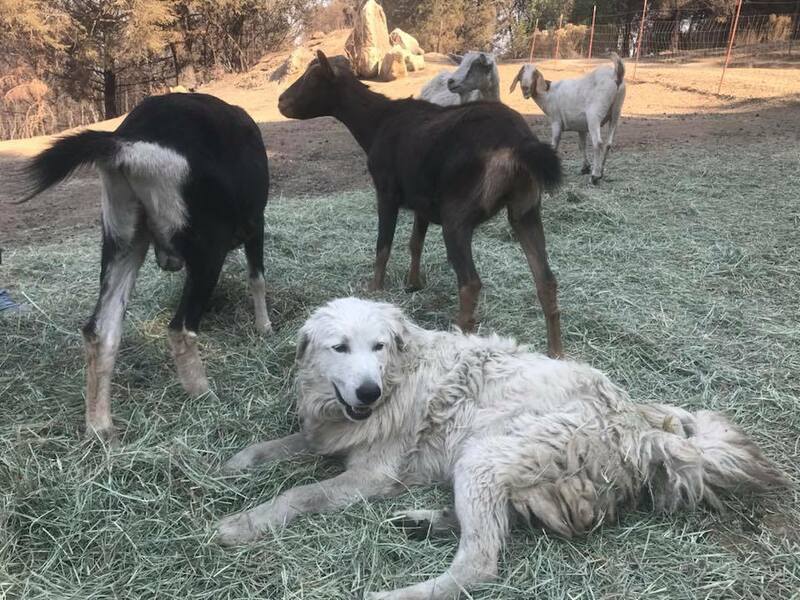 Odin, Roland Hendel's dog, protected his goats during the wildfire that destroyed Hendel's home. Two days after Hendel and his daughter fled for their lives, they went back to their land in the redwoods. It was dangerous — the main roads were blocked and fires were still burning. But they were desperate to check on Odin and the goats. "We expected either that the entire property would be decimated and Odin and the goats would be dead or that the fire would have missed us, and the house, the land and the animals would be OK."
What they discovered was both the worst and the best of outcomes. The house was gone, the trucks were gone, everything was ash and gray. All eight of them had survived. Odin did, too, limping, with singed fur and melted whiskers. But his tail still wagged. Hendel thinks he knows what happened. "What I think is Odin herded the goats into the middle of the pasture where there are a bunch of large rocks and kept them there. That's what saved them, I think." Of his goats, Hendel says, "They are magical beings." After another few days of anxious waiting, the entire herd and the dogs, Odin and Tessa, were taken to safety. They are now being cared for at a temporary farm-animal shelter at the Sonoma County fairgrounds. Josh Weil was finally able to get back to his home late Tuesday afternoon. When he approached the long drive leading up to his house, he was hopeful. The mailbox was still standing, with a letter his wife had put in the day the fire struck perfectly intact. The house itself was up around a bend. When he made the turn, there was nothing left. 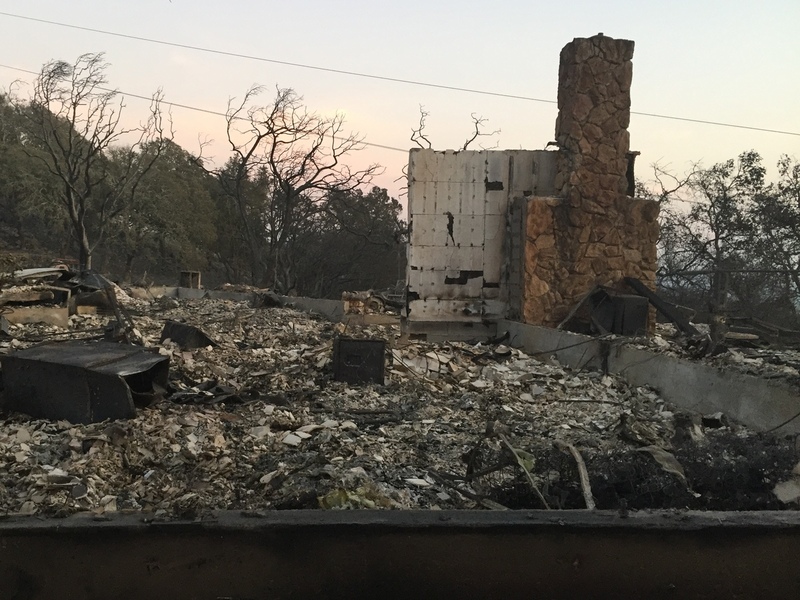 Claire Mollard managed to get her 15-year-old daughter, Sophie, and the family's two dogs out before wildfire consumed their home in Santa Rosa. "It was a gut punch," Weil says. "Everything was just ash and total destruction. I was trying to figure out where the entry way was and the garage. I could make out only an axle and wheel of my wife's car. And the landscape around the house as far as you could see was just gone. " As he shuffled through some things — watching objects disintegrate into ash as he poked at them — he heard the noise. It was unmistakable: a bleat that could only come from a goat. There, standing in the drive were Lucy and Ethel, singed and hungry and fine. Somebody, probably the firefighters, had even left them a bowl of water. He has no real idea how they survived, only a theory. "All I can think is the pasture was just low grass and so the fire couldn't sustain itself there." "He was saying, the goats are here, the goats are here!" Mollard says. It was one little wonder amid the loss. And it helped. "They are our little bright lights," she says. Lucy and Ethel are now being housed at a neighbor's barn that survived the blaze. The cat hasn't been found. But the goats have given them hope that maybe he, too, will find a way home.